In 2010, Chuck Lukacs release an incredibly fun instructional art book by the name of Fantasy Genesis which was such a gem that more people should know of. It's great to see another book from him after such a long wait. Fantasy Genesis Characters continues the creativity game from the earlier book and uses that to generate ideas for characters to draw. What you'll need are those game dice with multiple faces because you need those to generate random choices from the long lists of ideas and suggestions provided. This book is split into five parts. The first provides an introduction to character design. Chapters 2, 3, 4 and 5 are tips and techniques on designing characters using themes such as emotions, behaviour and archetype, costume and culture, and creatures. The instructions are insightful and the occasional drawing exercises will get your creative juices working hard. There are lots of illustrated examples and they look great as well. For the price of a book, you can now learn while you draw, and draw while you learn, and have tremendous fun at the same time. 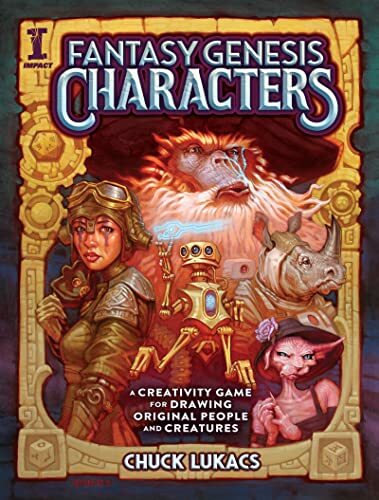 This is a wonderful book for those who want to learn more about fantasy art and character design.